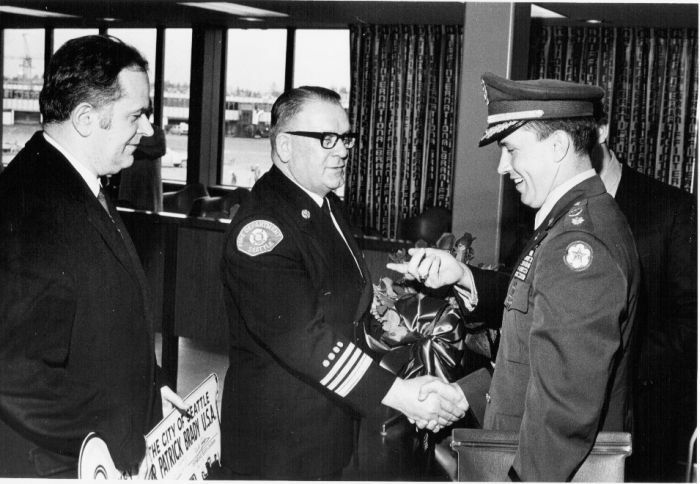 Jack Gordon, holding the Key To the City of Seattle, and Seattle Fire Chief Gordon Vickery present 1970's Seattle University's Distinguished Alumnus Award to Major Pat Brady, U.S. Army. Among the many heroes during the long war in Southeast Asia was Major General Patrick H. Brady, the first U.S. Army DUSTOFF pilot to receive the Medal of Honor. The son of one of World War II�s Darby�s Rangers, Brady was born in 1936 in Phillip, South Dakota. In 1959, Brady was commissioned through the Army Reserve Officer Training Corps from Seattle University. As a newly commissioned officer he attended the Army Medical Service School at Fort Sam Houston, Texas, and, upon graduation, followed with an assignment to the 6th Infantry Division stationed in Germany. In 1963, after completing helicopter training at Fort Rucker, AL, Brady was assigned to the 57th Medical Detachment (Aerial Ambulance) flying the Bell UH-1H Iroquois, known as the Huey, for the first of his two tours in South Vietnam. During this tour he served as a medical evacuation pilot in the Mekong Delta region of South Vietnam using the detachments standard callsign, DUSTOFF, picked because the helicopters often blew dust and shelters all over the men on the ground during pickups. After serving as the Detachment Commander, he was reassigned in January 1965 to Fort Benning, Georgia, where he helped form the 11th Air Assault Division, the predecessor to the famed 1st Air Cavalry Division. During this assignment Brady twice deployed to the Dominican Republic in support of U.S. peacekeeping operations. In 1967 he returned to Vietnam for his second combat tour in the UH-1H. Assigned to the 54th Medical Detachment at Chu Lai, Brady served as both the Operations Officer and as the Commander. It was during this tour that Brady flew his most heroic mission. On January 6, 1968, responding to a medevac request, Brady repeatedly faced enemy fire to evacuate wounded. After four flights and three damaged helicopters, he evacuated 51 seriously injured soldiers. For his actions on this day, President Nixon presented him with the Medal of Honor. During his two tours, he flew over 2,000 combat missions, rescuing more than 5,000 wounded soldiers. He later served as the Commander, 326th Medical Battalion, Fort Campbell, KY; Chief of Public Affairs for the Army, and Secretary to the United Nations Military Armistice Commission in Korea. His career culminated as Deputy Commanding General for Active Components, Sixth U.S. Army, Presidio of San Francisco, CA. Since his retirement in 1993 as a Major General, Brady has served as the President of the Medal of Honor Society, Chairman of the Citizens Flag Alliance, and Commissioner of the American Battle Monuments Commission. On January 6, 2009, the Blackfive Blog ran an article on the 42nd anniversary of Major Brady's actions that won him the Medal of Honor. It's worth reading.